Have you been to any garage sales yet? The next time you head out, look for things you can cover with chalkboard paint! 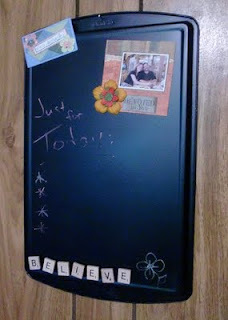 That's how I made this cookie sheet message board. Just about any solid surface can be covered with chalkboard paint. The spray can kind makes it even easier! Plan on painting several coats to make it smooth and even. For example, the cookie sheet that I used for my message center had a pretty nasty burn mark on the back from a label. But after two coats of paint (probably could have done three), you couldn't even see it! Follow the directions on the paint container for use. And wear gloves...trust me. You could write messages on my finger right now on the splotch I accidentally painted. You'll probably also want to work outside to keep fumes to a minimum. Just keep your item away from falling leaves, birds and any assorted bugs that might want to walk across your wet paint. We had already made the decision. This poor, diseased rose bush was going to come out. I had pruned it within an inch of its life to get rid of the speckled leaves. It was just time. And then there were a dozen tiny buds on each of three stalks. At first I didn't even notice them. And then they exploded into petals of soft pink that make my day every time I see them. 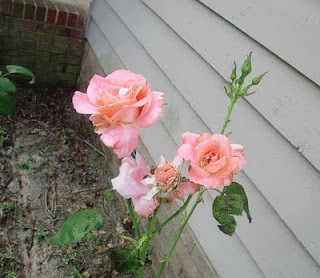 We had written off this pitiful rose bush because it wasn't looking or producing the way we assumed it should. What brings you delight? Family? Food? Stuff? There's nothing wrong with any of these delights, but they're not in line with God's desires for our lives. Make this a weekend of delight - in God first and foremost. Then He will provide the rest as He sees fit. And His delights don't have to be stored in the garage! I read an article the other day about the lengths people will go to pampering their pets. There are animal-only travel services, tricked-out toys, food that goes beyond 5-star restaurants and spa services that I wouldn't even treat myself to. I don't believe for a minute that animals know the difference between bottled water and tap water - despite what some of these owners believe! It seems more than a little excessive, especially with the current economic conditions. But the pet owners treating their birds to an aviary day care and their dogs to fur dying, it's just one more way to share their love with their four-legged companions. I don't know about you and your pets, but my girls have different definitions of pampering. And they have nothing to do with coordinating clothes, expensive food or accessorizing. This ravioli bake is one of those super-easy, last minute meals that is fun for kids but filling enough for adults. It only takes a few minutes to prepare and a half an hour of cook time! 1. Preheat oven to 350. Lightly grease a 9x9 inch baking dish. 2. Brown the ground turkey in a large skillet and drain off grease. Add water and taco seasoning. Reduce heat and simmer for 5 minutes. 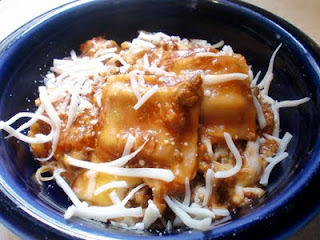 If using frozen ravioli, heat and combine with pasta sauce. 3. Cover bottom of baking dish with ravioli. Layer 1/3 of the turkey mixture on top of the ravioli, then layer on 3/4 cup of mozzarella cheese. 4. Continue layering with ravioli, turkey mixture and 3/4 cup of cheddar cheese. On the top layer, combine the remaining mozzarella and cheddar cheese. 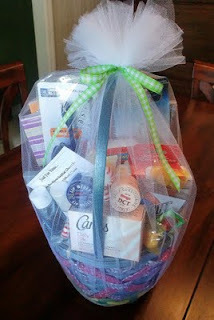 One of my favorite church projects is these gift baskets! Our Ladies' Sunday School Class gives a basket to each missionary wife that comes to visit us. We want to pamper them and thank them for the support they give their husbands. That's very important to us. The ladies in the class donate all kinds of travel-sized toiletries, books, note pads and little treats. Then they all get wrapped up in a basket! It's such a joy to be able to surprise a traveling missionary's wife with something special, from our hearts. And our church helps support 110 missionaries in 52 countries, so we put together many of these baskets each month. 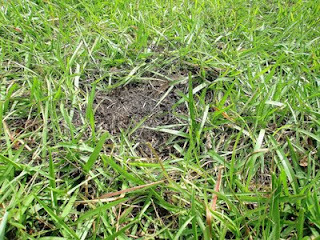 There are several of these holes in our front yard. They were left when the dandelions and other weeds were pulled this spring. 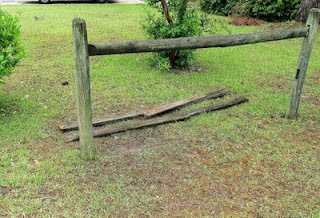 They're a little unsightly, but they are proof of the hard work my husband did in our yard. So now what? What can we do to fix these holes? I could plant a pretty flower in each one of them. That would brighten up the yard and give us something lovely to look at...for a while. Or we could put some sod, some pre-grown grass, over each one. It's not the same grass, though, and it might not root. Then there would be another dead patch to deal with. Has your week been as busy as mine? It seems like the days get shorter and the to-do list gets longer! But our Lord and Savior has a solution for times like these. Make this a weekend of calm and rest. You may not think that's possible right now, but Jesus Christ Himself is calling you. Listen, and let Him give you rest. When you ask the Lord for a blessing, you never know when or what He will provide. While bathing the girls this week, I was struck by how very different they are. 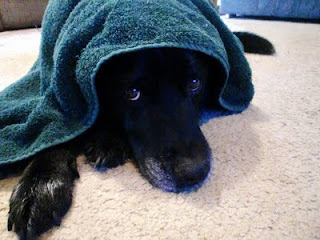 Bailey is my water dog - she'll get herself in the tub just so she can enjoy the warm water. She'll obey my every word, moving where I ask and staying when I need her to stay. The best part is drying her off, though. She delights in the massage of the towel and getting all wrapped up. She'll hang out for ages until she's completely dry, giving me her back feet when I ask. In the end, her obedience makes the task much easier for both of us. Sadie, on the other hand, is the complete opposite. She despises water, fights having to get into the tub and tucks her tail the whole time. She has to be as close to me as possible, which makes soaping and rinsing very difficult. 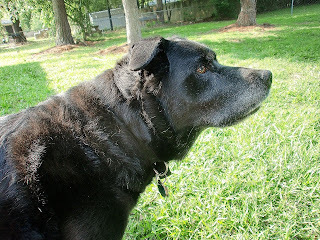 She ignores basic obedience commands which means I have to forcibly move a 60 pound dog over and over again. Sometimes you read about something and you just have to try it for yourself! Just hearing the words "bacon cinnamon rolls" peaked my interest. I'd seen several versions of this decadent breakfast treat, and I just had to make my own. All you need is a package of refrigerator cinnamon rolls (I chose the orange variety) and a package of bacon (I used turkey bacon). Start out by lightly cooking your bacon. You want it to be warmed up but not crispy. You're going to roll it in the dough, so it needs to be pliable. Just a couple of minutes on each side, enough to brown it, is plenty. 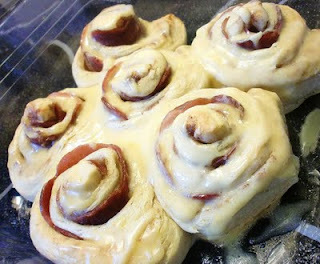 Open up your package of cinnamon rolls and unroll them to lay flat. On each roll, lay one slice of bacon. Tightly roll the combination back up and place in a lightly-sprayed baking dish. Sometimes you don't have the funds to buy all sorts of new craft supplies. Sometimes you just want to use up what you have on hand. Either way, your creativity and some leftovers can make for the sweetest projects. Like this one for example. I still have tons of Scrabble letters left over from other projects. There are also two round, self-adhesive magnets that have been staring at me for months. So put the two together and you have a fabulous craft. Because there are just two magnets, I used a pair of pliers with a cutting blade to turn them into eight tinier magnets. This made them the perfect size, too, for fitting on the back of the Scrabble tile. 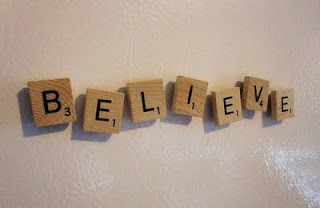 So now I have a simple, lovely, God-focused word on my refrigerator door. It took just a few minutes and used up some "ingredients" that I already had. Empty out your own stash and see what might go together for some home decor. The word meditation makes many people think of New Age, sitting in a funny position and chanting. But the Bible says meditation is an essential component of a Christian woman's life. The dictionary says that to meditate is to dwell on any thing in thought; to contemplate; to study; to turn or revolve any subject in the mind. I love the last part because it is very visual to me: turning and revolving the things of God in my head. The birds have it all figured out. Now women just have to catch up. 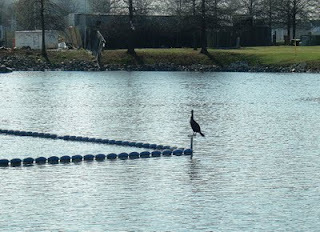 With seemingly effortless movement, these feathered creatures can plop down in the most unlikely of places and balance for ages. What do they have that we don't? Make this a weekend of balance - check your schedule, priorities and obligations. There's no reason Christian women can't be just as balanced as the many birds of the world. If we choose to follow God's plan. 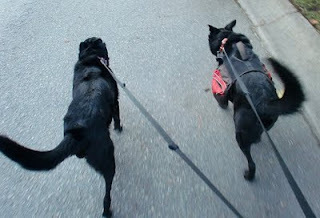 There are numerous benefits to a daily dog walk - improved cardiovascular health, bonding time with your pets, time to visit with neighbors and increased energy for the rest of the day. But there are also some hazards out there that need to be addressed. Whether you have a dog or not, whether you walk your dog regularly or not, take a look at the street in front of your house. There may be some dangers there you didn't even realize. 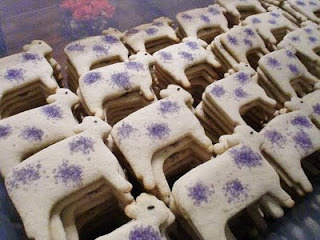 Even though I'm quite through with cows and sugar cookies for a while, this undertaking was the most fun I've had in ages! I'm glad Ladies' Jubilee only comes once a year! After searching for recipes and trying many different variations of dough and decorations, I settled on my grandmother's Christmas cookie recipe. Isn't it amazing how, with all of the new and exciting things out there, sometimes the old ways are the best? This is a super-easy recipe and takes about an hour from start to finish. Use a good amount of flour for kneading and rolling - it's a very sticky dough otherwise. 1. Preheat oven to 375 degrees. Lightly spray 2 cookie sheets with nonstick spray. 2. Sift the dry ingredients into a large bowl. If you have a stand mixer...use it! The dough will be very heavy and very sticky. 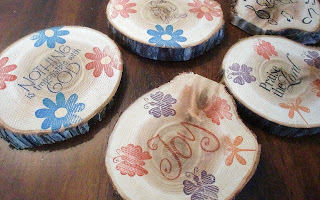 One of the most popular items I sold at our last craft show were these rustic coasters. Each one has a different phrase in the middle - Joy, Nothing is impossible with God, Praise the Lord and God Bless You, just to name a few. All you need for this project are a few tree cookies. You know, pieces of a log cut into coaster shapes. Then just gather up some of your stamping supplies and get creative! Once you're done stamping, spray the whole coaster with a semi-gloss polyurethane. This will seal up your designs without taking away from the colors of the wood. You can move beyond coasters and use this technique on any wood surface. Think about distressing and stamping small pieces of furniture. 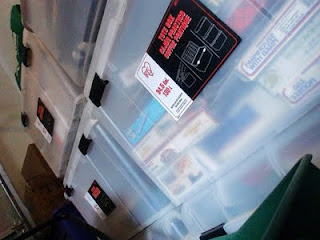 Or those boxes and chests you see at the hobby store. The only limits are your budget and your imagination! Are You A Bud Or A Bloom? 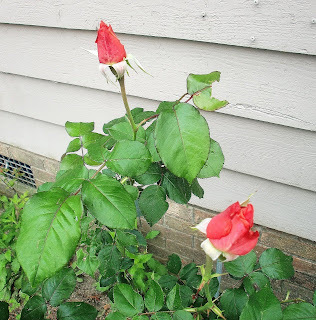 On the rose bush at the front of the house, there are two tightly-closed buds. I know from experience that they have the potential to be huge, bright pink flowers. But for the moment they are tucked away, wrapped up in their shell of petals. These two rose buds are like the Christian women who are satisfied with the mediocrity of life. They are very pretty just as they are - I could trim one bud off and it would make a lovely gift the way it is now. But there is so much more available to these women if they move past contentment. Mediocre women feel like they're fine the way they are. There's no reason to change or grow or be better and different than they are right at this moment. They're lovely rose buds, but there's so much more. 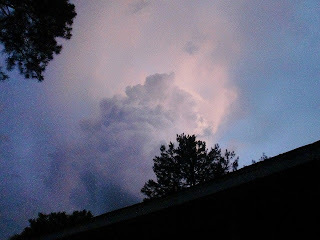 It could be the calm after a terrifying storm. It might be the gentle breeze of a Spring morning. Or it could be a miracle in the midst of an ordinary day. Or it might be a gentle nudge of the Holy Spirit just when you need it most. Be still this weekend and meditate in your heart. Look at all the little things God has done and stand in awe. Remember all the huge changes He has made in your life and stand in awe. Take in the beauty He has placed all around us and stand in awe. 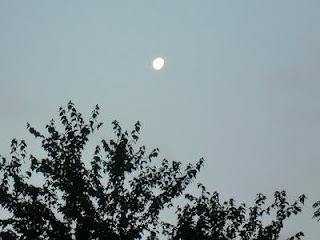 Then imagine what He might be planning for tomorrow...and stand in awe of the possibilities! ...what would it say to you? "Good to see you...it's been a while!" "Praise the Lord, this is the third time this week we've been together!" "Just once a week? I miss you the other six days." "If you want to hit your knees right here, I'll catch your tears." "The Lord desires your presence even more than I do. Thank you for being here." 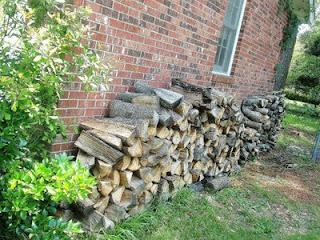 Danny and I have some extra yard work to do in our back yard. 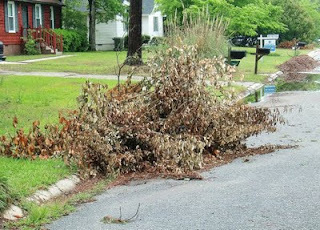 It's not because of weeds or pine cones...although those can be problems. Bailey has a special talent that creates more work. Bailey doesn't just chew on them or treat them like a snack, the way her sister does. Instead, she pulls them apart like BBQ pork! It's fun to watch, regardless of the clean-up time! This is very possibly my new favorite seafood dish. We were given a package of Chicken of the Sea pink salmon - something I've never had in my entire life. I didn't know what to do with it, so it's been sitting in the cupboard. In an effort to save money and use up the staples we already have, I came across this salmon. 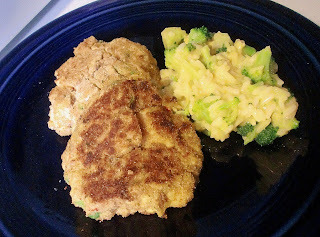 Flipping it over, there was a recipe that sounded wonderful - simple salmon cakes. There were only a few ingredients and it would take no time at all. That's my kind of recipe! It turned out to be delightful, filling and very healthy. 1.Combine first 6 ingredients in a large bowl. Stir in salmon, egg and 1/3 of the bread crumbs. The Easiest 3D Embellishment Ever! When you're looking for something out-of-the-ordinary and fun for you paper crafting, you don't have to spend a single cent! 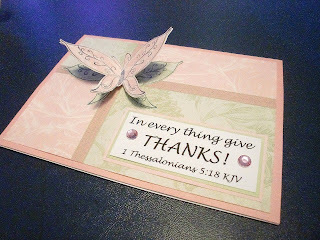 This super-easy 3D embellishment is the easiest way ever to add dimension and excitement to an otherwise boring page. Start with three identical images. I used three stamped butterflies on two different colors of paper. They need to be symmetrical images so the edges will all line up. The best part is you can use stamped images, stickers or die cuts, whichever you have on hand. Choose your best image and lay it face down on your workspace. This is going to be the top image that you see all of. Attach half of the second image to half of the main one. 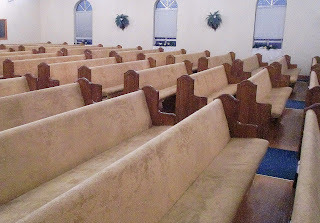 Trim around the edges if necessary so you can't see that there are two together. If you don't adhere just half of the image, it won't pop up.